WASHINGTON — In an abrupt reversal, the U.S. military on Tuesday said it made a mistake when it ordered an independent federal auditor to stop providing the public with information about U.S. war efforts in Afghanistan that help to measure how the 16-year-old stalemated war is going. Just hours after the report was publicly released, the U.S.-led NATO coalition in Afghanistan issued a statement blaming “human error” for the order, and provided a few segments of the data that has been restricted. The newly released information revealed that 44 percent of Afghanistan is contested or under the control of insurgents. Other previously available information on the size, attrition and performance of the Afghan forces continue to be unavailable. President Donald Trump has announced a new Afghanistan strategy aimed at breaking a battlefield stalemate by accelerating Afghan-led operations against the Taliban and other insurgent groups in the country. On Monday, Trump railed against the recent string of attacks in Afghanistan, and ruled out any U.S. discussions with the Taliban as part of the effort to seek peace talks between the Afghan government and the insurgents. The Islamic State group and the Taliban are competing to take credit for a horrific spike in violence in Afghanistan over the last month, and analysts say both insurgent groups are growing in strength as security forces wither under their relentless attacks and a feuding government struggles to win over citizens. The auditing agency, established by Congress and known as the Special Inspector General for Afghanistan Reconstruction, or SIGAR, revealed the new gag order in a three-month assessment of conditions in Afghanistan released overnight. The restrictions seemed to contradict previous Pentagon assertions that it was striving to be more transparent about the U.S. war campaigns across Iraq, Syria and Afghanistan. In response to the release of the report, Navy Capt. 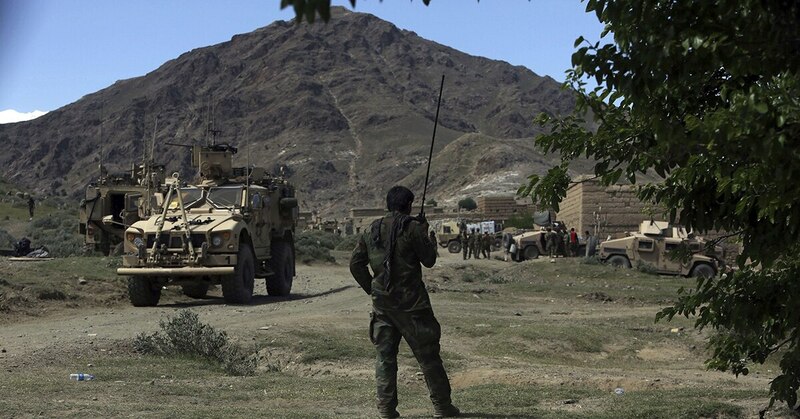 Tom Gresback, coalition spokesman, said Tuesday that about 56 percent of the country’s 407 districts are under Afghan government control, 30 percent are contested and 14 percent are under insurgent control. Late last year, a Pentagon report said the Afghan government has control or influence over 60 percent of the population, while insurgents had control or influence over approximately 10 percent of the population, with the remainder contested. In November, Gen. John Nicholson told Pentagon reporters that about 64 percent of the population was controlled by the government, 24 percent live in contested areas, and the Taliban control the remaining 12 percent. Neither the Pentagon nor Nicholson details the number of districts held by each side, so it is difficult to compare that with the population figures released by Gresback. Over the years, the SIGAR auditing effort has revealed many dubious practices by the U.S., including instances of contractor fraud. Since January 2016 it had published data on the number of governing districts controlled by Kabul, the number controlled by the Taliban, and the number that are contested. John F. Sopko, head of the auditing organization, expressed disappointment that the Pentagon initially had forbidden release of the data on relative control of the governing districts. “The number of districts controlled or influenced by the Afghan government had been one of the last remaining publicly available indicators for members of Congress — many of whose staff do not have access to the classified annexes to SIGAR reports_and for the American public of how the 16-year-long U.S. effort to secure Afghanistan is faring,” he added. The war effort has sometimes faded from U.S. public attention, even though the U.S. has invested about $120 billion in reconstructing Afghanistan since 2002. Sopko said in his report that the Pentagon also classified or otherwise restricted information that his organization had previously reported publicly, including such “fundamental metrics” of the Afghan military and police performance as Afghan casualty figures and most measurements of the battlefield capabilities of the Afghans military.